The Free-To-Air (FTA) distribution of content allows consumers to access various and rich TV programs without requiring any subscription. Thus, advertising and sponsorship help broadcasters to reach a much larger audience. This business model requires very cost effective content protection solutions based on subsets of traditional DRM offer. Inside Secure’s Content Protection Client, Essential Agent, is the right fit. It takes a full advantage of Inside Secure’s award winning software protection with anti-tampering, obfuscation, white boxing and jailbreak detection (optional) to protect data and computations. This efficient set of countermeasures guarantees integrity checking, good resistance to reverse engineering, in addition to keys and other secrets scrambling. Content Protection Client, Essential Agent, offers the best HD experience on Android supported by most of the adaptive streaming and static file protocols (Apple HTTP Live Streaming, Microsoft Smooth Streaming, MPEG-DASH, PIFF) and a rich set of extra features including Download & Play, subtitles and immersive audio. The technology is fully approved for premium content distribution on Consumer Electronic devices including mobile phones and tablets. 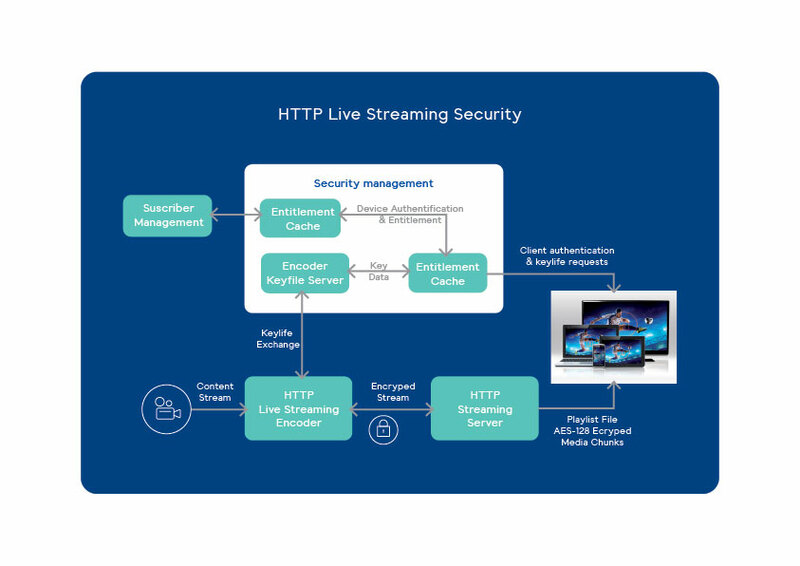 When distributed over HTTP Live Streaming adaptive streaming standard protocol, the content can be encrypted and protected by the AES-128 government approved strong cryptography. It's robust implementation of this algorithm protects the keys while videos are decrypted. The light but secure infrastructure makes content monetization possible even in a tough Free-To-Air economic model. The solution being 100% software allows application distribution with current industry channels. This offers a complete flexibility and a full cross Android platform compatibility. This is also a strong security argument since it makes possible immediate over-the-air enhancements and upgrades providing fast reactivity against new attacks. With Content Protection Client, Essential Agent, Inside Secure provides a rich Software Development Kit (SDK) including a full-featured media player with full media format awareness, complete security measures, robustness, plus extra features such as offline playback, multiple subtitles, output protection level enforcement, etc. For most application developers, this is the preferred approach since it requires less expertise in security integration and generally meets compliance requirements while significantly reducing the level of effort and the time-to-market. Content Protection Client, Essential Agent, SDK allows application customization of look, feel and branding with a minimal amount of effort. It provides the ability to be integrated with existing applications and Graphical User Interfaces (GUIs) to deliver branded services to all types of connected mobile devices with a very short time-to-market. It also offers easy-to-use and well documented functions allowing quick integration with any Android application, ensuring seamless branding and user experience across platforms and needs to support enhanced offerings with specific content like subtitles, multichannel audio or closed captioning. Inside Secure brings the ability to design functionality prior to executable code generation. This feature saves time on integration as the integration is done only once and the actual deployed schemes can be chosen at code generation.